Centromeres, as most other heterochromatic domains, localize at the nuclear periphery, which is redundantly controlled by several mechanisms in the fission yeast Schizosaccharomyces pombe. 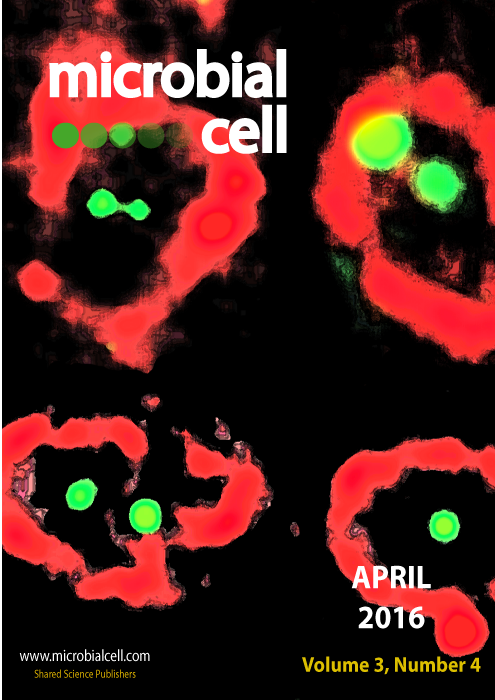 The cover is an art version of live-cell images of several nuclei lacking both the lamin-associated homolog Lem2 and the centromere-clustering factor Csi1. In those nuclei, the centromeres (green, GFP-fusion with the kinetochore protein Mis6) are delocalized from the nuclear envelope (red, mCherry-fusion with the nucleoporin protein Cut11). Image by Sigurd Braun and Ramón Ramos Barrales (Ludwig-Maximilians-University München, Germany); modified by MIC. The cover is published under the Creative Commons Attribution (CC BY) license.